Everything and every phenomenon in the world, other than man and jinn is administered totally by God-made laws, they are obedient to God and submissive to His laws, i.e. they are in the state of Islam. Man possesses the quality of intelligence and choice, thus he is invited to submit to the good will of God and obey His law, i.e. become a Muslim. Submission to the good will of God, together with obedience to His beneficial law, i.e. becoming a Muslim, is the best safeguard for man's peace and harmony. Allah is High and Supreme but He is very near to the pious thoughtful believers; He answers their prayers and helps them. He loves the people who love Him and forgives their sins. He gives them peace, happiness, knowledge and success. Allah is the Loving and the Provider, the Generous, and the Benevolent, the Rich and the Independent, the Forgiving and the Clement, the Patient and the Appreciative, the Unique and the Protector, the Judge and the Peace. Allah's attributes are mentioned in the Qur'an and the Sunnah of the Prophet Muhammad (saws). Allah creates in man the mind to understand, the soul and conscience to be good and righteous, the feelings and sentiments to be kind and humane. If we try to count His favours upon us, we cannot, because they are countless. In return for all the great favours and mercy, Allah does not need anything from us, because He is Needless and Independent. Allah asks us to know Him, to love Him and to enforce His law for our benefit and our own good. A Muslim believes in all the Messengers and Prophets of God without any discrimination. All messengers were mortals, human beings, endowed with Divine revelations and appointed by God to teach mankind. The Holy Qur'an mentions the names of 25 messengers and prophets and states that there are others. These include Noah, Abraham, Ishmael, Isaac, Moses, Jesus and Muhammad. Their message is the same and it is Islam and it came from One and the Same Source; God, and it is to submit to His will and to obey His law; i.e., to become a Muslim. The Qur'an is the sacred book of the Muslims. It is the last book of guidance from Allah, sent down to Muhammad, peace be upon him, through the angel Jibraeel (Gabriel). Every word of it is the word of Allah. It was revealed over a period of 23 years in the Arabic language. It contains 114 Surahs (chapters) and over 6000 verses. The Qur'an deals with man and his ultimate goal in life. Its teachings cover all areas of this life and the life after death. It contains principles, doctrines and directions for every sphere of human life. The theme of the Qur'an broadly consists of three fundamental ideas: Oneness of Allah, Prophethood and life after death. The success of human beings on this earth and in the life hereafter depends on obedience to the Qur'anic teaching. The Qur'an is unrivalled in its recording and preservation. The astonishing fact about this book of Allah is that it has remained unchanged even to a dot over the past fourteen hundred years. No scholar has questioned the fact that the Qur'an today is the same as it was revealed. Muslims till today memorize the Qur'an word by word as a whole or in part. Today, the Qur'an is the only authentic and complete book of Allah. Allah is protecting it from being lost, corrupted or concealed. People with good records will be generously rewarded and warmly welcomed to Allah's Heaven. People with bad records will be fairly punished and cast into Hell. The real nature of Heaven and Hell are known to Allah only, but they are described by Allah in man's familiar terms in the Qur'an. A Muslim believes that the Qur'an is the word of Allah revealed to prophet Muhammad through the Angel Gabriel. The Qur'an was revealed from Allah on various occasions to answer questions, solve problems, settle disputes and to be man's best guide to the truth. The Qur'an was revealed in Arabic and it is still in its original and complete Arabic version today. It is memorized by millions. A Muslim also believes in a clear distinction between the Qur'an and the Traditions (called Hadiths) of the Prophet Muhammad. Whereas, the Qur'an is the word of Allah, the Traditions of Prophet Muhammad (hadiths - i.e. his teachings, sayings, and actions) are the practical interpretations of the Qur'an. Both the Qur'an and the Hadiths of Prophet Muhammad are the primary sources of knowledge in Islam. Praying to the Creator on a daily basis is the best way to cultivate in a man a sound personality and to actualise his aspiration. Allah does not need man's prayer because He is free of all needs. 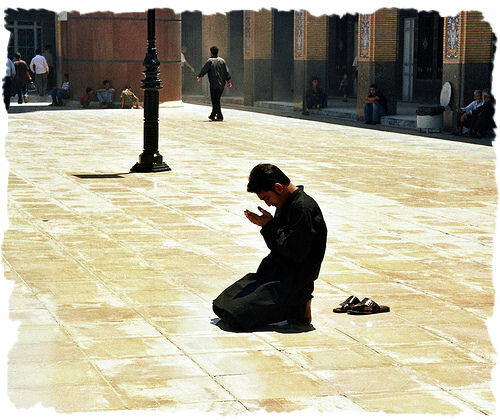 Prayer is for our immeasurable benefit, and the blessings are beyond imagination. Highly recommended prayer: Those accompanying the obligatory prayer and the two great festival prayers. Optional prayer: Voluntary prayer during the day and night. Note the obligatory nature of Zakah; it is required. Muslims can also go above and beyond what they pay as Zakah, in which case the offering is a strictly voluntary charity (sadaqah). Muslims go to Mecca to glorify Allah, not to worship a man. The visit to the tomb of Prophet Muhammad at Medina is highly recommended but not essential in making the Hajj valid and complete. Sayyid Abu Al-'Ala Maududi, Islam: Its Meaning and Message, in M. Tariq Quraishi (ed. ), American Trust Publications, Indianapolis, Indiana, 1984, 12-14.